Tuberculosis (TB) is an infectious disease caused by Mycobacterium tuberculosis. This disease has a high prevalence rate in the world, with fairly high mortality rate, it is estimated that one third of the world population has infected with M. tuberculosis and 2.000.000 mortality cases each year is correlated with TB [1,2]. In pediatric population, TB case in the world has reaches 530.000 cases with developing countries is the most prevalent area. The most common affected organ is the lungs, but in recent years an increase of extrapulmonary TB incidence is observed . In pediatric population, extrapulmonary TB is frequently occured, which accounts for 30%-40% of total TB cases . Recently, laryngeal tuberculosis that was correlated with the severity of infection/expansion of the pulmonary TB frequently becomes the primary disease in that organ5. Laryngeal TB is categorized as a rare case with prevalence rate approximately 1% of total cases, eventhough larynx is the third most common area from ear-nose-throat areas affected by TB after cervical lymph node and ear [4,5]. A 7 months-old girl, with chief complain of voice loss and breathy sound was referred from Banyumas Hospital to the ENT department of Dr Sardjito Teaching Hospital Yogyakarta. Patient was referred with suspicion of laryngomalacia because of continued breathy sound that progressive with supine position. After thorough history examination, a severe cough history that needed hospitalization because of dyspnea was found. According to her parents, at the previous hospital the patient received nebulization therapy and saline infusion, after that the patient condition was improved and she was discharged from hospital, but the breathy sound persisted. Her ENT physical examination showed inspiratory stridor and voice lost with crying, substernal and intercostal retractions and large amount of thick discharge on throat examination. Endoscopic examination was performed to see if the patient had upper airway abnormality, and the results showed type 1 laryngomalacia (redundancy of arytenoids tissue), laryngeal diffuse edema, and granulation formation around aditus laryngeal and arytenoids and there was irregularity of the bilateral vocal cords mucosal structures, with normal vocal cords movement (Figure 1). 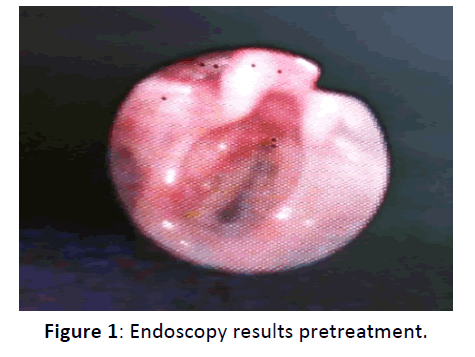 Figure 1: Endoscopy results pretreatment. Further history taking revealed that her father had pulmonary TB and just finished his 6 months multidrugs treatment 2 months before. This patient lives with his father and mother and 11 another family members in a small house with size of 6 m x 9 m. This patient has a high possibility of TB infection, and this was supported by the endoscopy results, this patient was then referred to the pediatric department for tracking the disease and further management (Figure 2). Figure 2: Chest X-Ray before TB treatment: Miliary TB. Pediatric department performed GeneXpert and sputum BTA examination for this patient and the results were TB positive and no rifampicin resistance. This patient then received pediatric multi-drugs TB treatment. During 1 week therapy her condition was improved, her voice started to develop, and the dyspnea was resolved, therefore this patient was allowed to be treated as an outpatient. Evaluation in ENT clinic with endoscopy was performed approximately 2 weeks later and the results showed improvement condition, reduction of the laryngeal edema and granulation tissues. Her general condition was quite good with fair nutrition state (Figure 3). Figure 3: Endoscopy results post-treatment. Tuberculosis caused by M. tuberculosis is one of the most bacterial disease that attacks human. According to Global TB WHO report, in 2011 there was 8,7 million of new TB cases, with 13% co-infected with HIV and the mortality rate caused by TB was 1,4 million. Chronic infection can attacks multiorgan system inside human body . The most prevalent cases of TB was found between 4-6th decade, many reports have mentioned that there was a male predominance for this disease with male to female ratio were varied between 1, 5:1 and 9:1 . The use of antituberculosis chemotherapy has successfully decreases the TB incidence eventhough recently there is increasement in extrapulmonary TB cases included otolaryngeal TB that is frequently correlated with HIV infection . In 1940, the prevalence rate of granulomatous type of tuberculosis inside larynx had reached 10%, but between 1960-1980, this number had reach>60% because of the advanced of antibiotic and laryngoscopy . During pre-antibiotic era, there was a very high occurence of laryngeal TB and it was correlated with pulmonary cavity lesions with incidence rate reached 40%. This high number was also accompanied by high mortality rate that was caused by laryngeal TB due to severe odynophagia and dyspnea that was caused by granulation formation and laryngel edema. Hence after antibiotic was discovered, improvement of living state, and the widespread of public health, laryngeal TB was rarely found, which was only <1% of overall TB cases . In pediatric cases, laryngeal TB occurs more frequently without accompanied by pulmonary infection . Eventhough laryngeal TB predominances in male adult population and rarely occurs in pediatric , this presented case was found in a child with history of positive TB contacts, negative result in acid fast bacillus (AFB) sputum examination, and miliary TB imaging in Chest X-Ray results. Laryngeal tuberculosis can affects all laryngeal areas with predominance of the vocal cords [3,6,7]. The possible manifestations of this disease are edema, hyperemia, or ulcerative lesion3. Although it was mentioned that the appearance of ulcerative lesion has shift toward hypertrophic, exophytic, and polypoid type lesions [5,7]. On endoscopic evaluation, 50% patients have severe laryngeal lesions (ulcerative or perichondrotic lesions) and mostly with multiple subsites . On this presented case, the examination results showed type 1 laryngomalacia (redundancy of arytenoids tissues), diffuse edema of larynx, and granulation formation surrounding aditus larynges and arytenoids and structural irregularity of bilateral vocal cords mucosal, with normal vocal cords movement. The traditional symptoms of laryngeal TB that commonly found include fatigue, weight loss, night sweating, and hemoptysis. But recently, the main symptoms are hoarseness, stridor, dysphagia, and odynophagia [5,7]. In 80-100% cases, hoarseness symptom is developed and 50-67% develops odinophagia symptom . This is in accordance with this presented case where the chief complain were hoarseness, cough, dyspnea, breathy sounds, and poor breastfeeding. Laryngeal tuberculosis is frequently misdiagnosed and need an extra time to defines the appropriate treatment therefore at the time of its diagnosis, the infection has already spread and has become a public health problem6. Laryngeal tuberculosis is quite difficult to be differentiated from chronic laryngitis and laryngeal carcinoma . In this presented case, the clinical features, imaging and tuberculin test of the skin are not specific to diagnose laryngeal TB . On physical examination of larynx, the results are varied and there is no specific features that can be used to guide the diagnose of laryngeal TB . Tuberculosis must be considered as a differential diagnosis in the case of soft tissues mass in head and neck areas, especially when atypical clinical features and imaging are found . An abnormal chest X-Ray could shows positive results, although if there is no abnormality, the possibility of laryngeal TB cannot be excluded . The definitive diagnose of TB can be confirmed with histopathology evaluation. Performing Mycobacterial smear and culture are difficult for extrapulmonary TB because of low pathogen concentration in specimens with 2 months delay to confirm the TB diagnosis. In cases suspicious as extrapulmonary TB, an immediate and acurate evaluation with Polymerase Chain Reaction (PCR) is needed . In this presented case, another adjuvant evaluations afore mentioned was used, they were sputum evaluation with the results showed negative AFB and CXR which showed features of miliary type TB, detection with genXpert was also performed which showed low detected TB and no rifampicin resistance. There are two theories correlated with the spreading of laryngeal TB. The first theory is bronchogenic theory which mentions that larynx can get infected through direct spread of majority bacilli from pulmonary TB. The second theory is hematogen and lymphogen theory which said that bacilli spread through hematogen and lymphogen routes from primary infection lesion. From those two theories, bronchogenic route was said to be the most common infection route of laryngeal TB . According to the WHO guidelines, the management of extrapulmonary TB is with 4 TB drug regimens for 2 months and followed by 2 TB drug regimens for 4 months . Majority of the symptoms will improve in few weeks after the start of treatment and larynx will nearly resolves to the normal condition after few months therapy . Surgery is rarely performed. Surgery is preferred for early diagnosis and early treatment initiation ; hence surgery can play an important function if the disease has causes airway obstruction or laryngeal fibrosis . Laryngeal biopsy is not neccessary if the diagnosis of pulmonary TB has already confirmed because this examination is useless if the bacterial load is high. If the TB treatment response in the first few weeks was poor, laryngeal biopsy need to be considered to explore its differential diagnosis, laryngeal carcinoma . In pediatric laryngeal TB case presented here, the management was performed in accordance with WHO recommendation which was pediatric OAT treatment. The evaluation after 1 week OAT treatment showed some improvement, the voice was began to develop, and the dyspnea was resolved, therefore this patient was allowed to be treated as an outpatient. Approximately 2 weeks later, evaluation with bronchoscopy was performed and the results showed some improvement, laryngeal edema and granulation tissues were reduced. Laryngeal tuberculosis in children is a rare case, but recently its incidence tends to increases. Laryngeal tuberculosis is frequently correlated with pulmonary TB infection, but recently laryngeal primary infection is more prevalent. Laryngeal tuberculosis can affect all areas in larynx, with predominance of the vocal cords area. The symptoms of patient with laryngeal tuberculosis include hoarseness, stridor, dysphagia, or odynophagia and dyspnea if laryngeal obstruction caused by laryngeal TB has emerged. The diagnosis can be confirmed with histopathology evaluation, but PCR method is preferred because it consumes less time and produces acurrate results. Management of laryngeal TB in this case was carried with antituberculosis medications based on WHO recommendations. With those regimens, patient symptoms improved in first few weeks of treatment and her larynx nearly resolved to its normal condition in few months. Surgery can be performed if biopsy evaluation is needed and if the disease has obstructs the airway. Matthews PC, Pickles J, Berry J, Salisbury JR, Barker RD, et al. (2006) Airway emergency in tuberculosis. J Infect 52: 147-150. Menon K, Bem C, Gouldesbrough D, Strachan DR (2007) A clinical review of 128 cases of head and neck tuberculosis presenting over a 10-year period in Bradford UK. J Laryngol & Otology 121: 362-368. Abid W, Gamra OB, Ghorbal H, Beji I, Zribi S, et al. (2014) Extra nodal ENT tuberculosis. Egyptian J Ear Nose Throat Allied Sci 15: 279-282. Giacomet V, Bonardi CM, Paradiso L, Coletto S, Vigano A, et al. (2014) A case of laryngeal tuberculosis in a pediatric patient. Asian Pac J Trop Dis 4: 656-658. Handler EB, Quinn K, Wen A, Greenhow T, Gottschall J (2012) Pediatric laryngeal tuberculosis: A case with significant diagnostic challenges. Int J Pediatr Otorhinolaryngol 7: 36-38. Kurokawa M, Nibu K, Ichimura K, Nishino K (2015) Laryngeal tuberculosis: A report of 17 cases. Auris Nasus Larynx 42: 305-310. Silva L, Damrose E, Bairão F, Mayra L, Nina D, et al. (2008) Infectious granulomatous laryngitis: A retrospective study of 24 cases. Eur Arch Otorhinolaryngol 265: 675-680.